For constructing the contour on the list of points press <Profile by function> button and in opened window choose the <Points input> tab. Points coordinates given by user in table on left side of the window. 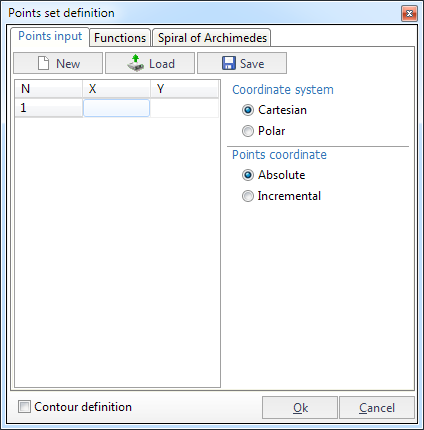 The points coordinates can be defined for the <Cartesian> or <Polar> coordinate system. The coordinates can be set in <Absolute> or <Incremental> values. If the coordinate values are incremental then coordinates of every point are addition values relative the previous point. If the <Contour definition> option is switched on then a contour is constructed as the function result but the result is a point set otherwise. <Save> – opens file dialogue to save points list.